Is there a better alternative to Delivery Tracking? Is Delivery Tracking really the best app in System category? Will Delivery Tracking work good on macOS 10.13.4? Delivery Tracking tracks your packages for you with precise, auto-updating, details and reveals your items location on our built-in map. And with our countdown feature, you'll know the day your doorbell is going to ring. You can also choose to receive notifications on package updates so you're up-to-date with its location. Tracking Amazon orders is as simple as copying the tracking number and naming your package. 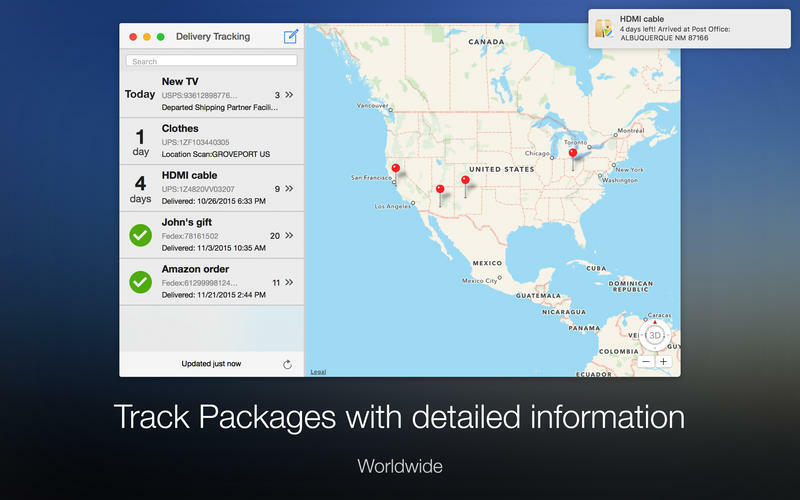 Delivery Tracking automatically pastes the tracking number and with Delivery Tracking's auto-carrier-detection system, finds the carrier for you. Delivery Tracking needs a review. Be the first to review this app and get the discussion started! Delivery Tracking needs a rating. Be the first to rate this app and get the discussion started!